Would you think about taste or texture, flavour or the way feels in your mouth, the essential ingredients or how it can stir a specific memory and create a certain mood? Would you attach it to a location – a restaurant, a party, a place in time – or remember it through colour, the patterns created on the plate, the image etched in your mind? It won’t come as a surprise that description, appearance and context can play as much, if not more, of an important part in our enjoyment of food and our willingness to eat it as taste itself. While I’ve always valued the flavour of my food above anything else, in the time I’ve been blogging I’ve come to understand that these other factors are impossible to ignore. And although I’m working hard to improve the photography on this blog, I’m not just talking about the impossibly glossy photos that adorn the pages of our favourite websites and recipe books, that we pin religiously to Pinterest or bookmark with excited anticipation. Think about that plate of seafood you ate last summer on holiday or the first batch of cakes you ever baked with your Mum, slightly sunken in the middle with as much batter smeared over the kitchen work surfaces as actually in the tin. Both are likely to have lodged in your memory as pinnacles of perfection in taste, yet so many other influencing factors will have come into play – the sun, your carefree mood, the indescribable joy of being allowed to lick the spoon. Anyone who reads this blog on a regular basis will know that memories are an enormous inspiration for a lot of my recipes. Baking brings with it a great sense of nostalgia, whether recreating a favourite childhood recipe or attempting to inject new life into an old fashioned classic. Presentation is also hugely important to me – as much as anyone else I eat with my eyes, and if something looks visually enticing, you’re half way to sealing the deal. While I’m generally a patient person, and enjoy the attention to detail of making macarons and chocolate roses or shaping croissants, there are a few foods which I just don’t seem to have the willpower to leave well alone. One is a roast chicken – crispy skinned, golden and simply stunning when it emerges from the oven, it’s soon torn to pieces by my total lack of carving skills. Another is a loaf of freshly baked bread – I know it’s full of steam and needs to be allowed to cool a little, but who am I to resist a slice of still warm, crusty bread? 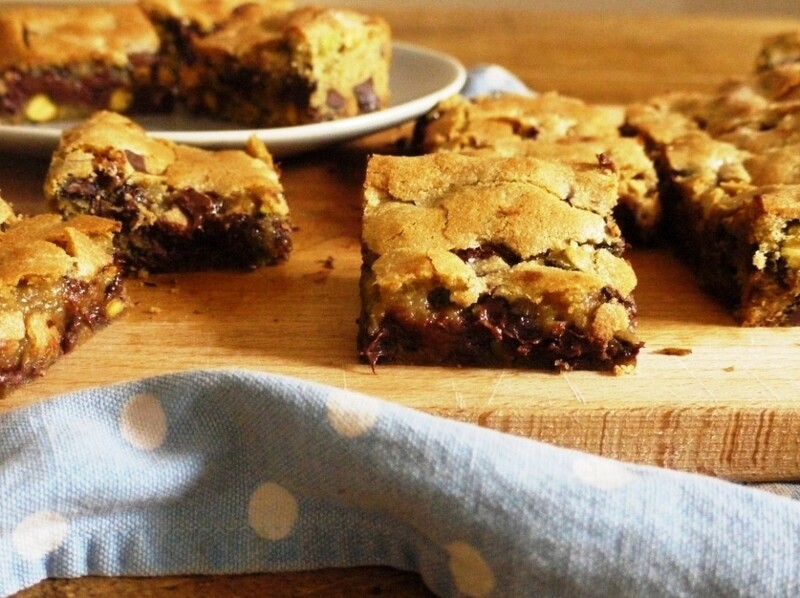 And then there’s brownies, or any other gooey baked bar for that matter . . . The first time Carnivorous Boyfriend ever visited my house at university, I baked him a batch of my Mum’s signature brownies. He’d come round for tea, but since I don’t like hot drinks, the baked goods are always going to be the highlight of this kind of occasion. In my excitement (read nervousness) I slightly underbaked the batch, tried to cut them far too quickly and ended up with an ooey gooey mess that splodged across the mismatched student plates and would have been better spooned or scooped up with a finger than any attempt to slice it into bars (so spoon and scoop we did). I know that brownies should be allowed to cool completely before being cut into squares. Some chefs even suggest chilling them (Ottolenghi) or freezing them (David Lebovitz) to achieve those picture perfect pieces with lovely straight edges and a regular size and shape. I’ve read the recipes, I know the tricks of the trade and I’ve baked enough batches of brownies to know exactly what I’m doing. But then they emerge from the oven and there’s something in me that simply can’t resist slicing into the shiny cracked top, pressing down to the squidgy centre below and pulling out a warm, soft, slightly sticky bar from the middle of the tray. All this is a slightly round about way of saying that I baked some blondies; that I couldn’t resist cutting into them a little too soon; that chocolate splurged from the middle and that the crust gave way to a squidgy, molten bar of blond deliciousness below. If you leave them to get cold, they will slice into lovely even bars: rich, dense and slightly chewy with a hit of bittersweet chocolate to counteract all that sugar and the slightly salty crunch of toasted green pistachios. Or you could dive straight in like I did. I’m not going to judge you. Preheat the oven to 180 degrees C. Grease and line a 20cm square tin with baking parchment. Pour your pistachios onto a baking sheet and roast for 4-5 minutes until golden. Remove from the oven, sprinkle with a small amount of salt then set aside to cool. Melt your butter in a small saucepan then set aside to cool. Beat together the eggs and sugar until just combined. Add the cooled, melted butter and beat until smooth, then fold in the flour and raising agents. Stir in the chocolate chunks and toasted pistachios until just combined. Scrape the mixture into your tin and bake for 20-25 minutes, until the top is set and golden but there is still a slight wobble in the centre. Remove from the oven and allow to cool before slicing. Or don’t. Chocolate + pistachio … yum, yum. These looks delicious. 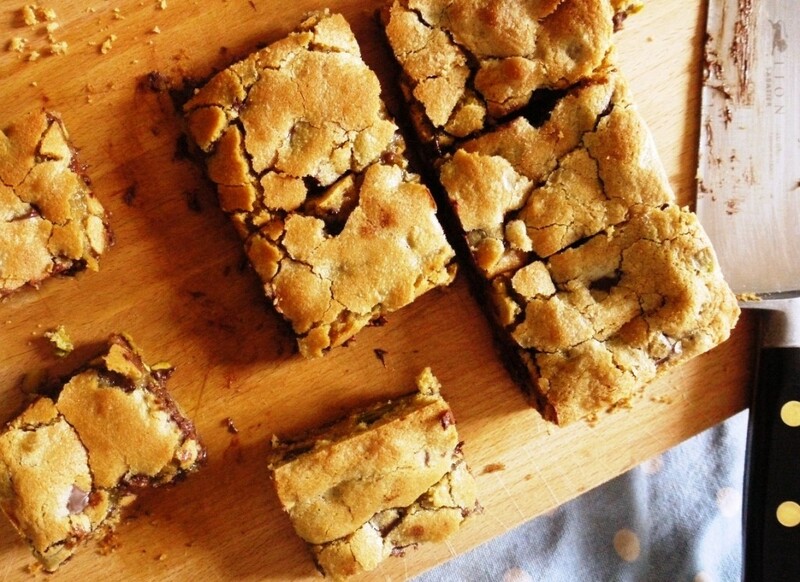 I think blondies/brownies are definitely best when they’re all warm and squidgy and fresh from the oven, no disagreement from me! I can never wait to cut them either. Your blondies look wonderful! I’m diving straight in. Probably with ice cream puddling over the top. The only incentive I can think of for letting them cool is so you can trample them through ice cream later on. The Single Gourmet + Traveler – thank you. Tori – ice cream is a great call, we had them with big scoops of vanilla and praline ice cream last weekend. I have to admit that brownies are not my favourite choice when it comes to baking with chocolate but perhaps blondes may be the answer! I do love nuts in any shape or form and I love the colour of blondes too. I may find these hard to resist but I am also a fan of fridging them for a firmer texture. Strangely I don’t like the gooeyiness and I would never be seen ordering a chocolate fondant on a restaurant…..far too runny for me!! I usually make blondies with peanuts and very dark chocolate to balance the sweetness, but pistachios are such a good combination! And the contrast of colors, so nice. Cutting them warm is not good for the pictures (though I don´t see yours suffering from it) but soooo very good for eating them! Ahh, now one of the factors you left out which can be so important is description. As well as fantastic photos, you have that gift too. Just the title of your post had me going week at the knees, not just any old pistachios but toasted pistachios. Then a fantastic description of not being able to resist slicing into shiny cracked top & pressing down into squidgy centre etc etc – I think it might be even better than the pictures, although they looked every bit as good as I could have hoped for. Just fabulous. ps – if you ever get a chance to write a baking book – please go for it. I will be first in the queue. I agree with you sometimes its good to just shoot the food as it is in it’s wholoesome just as it is state with no frills. This is not only good for you the baker but you the photographer equally. Photography is an art form and certainly just as big a learning curve as baking is. The photographs on here are just as they should be, no fuss, the rustic charm of uneven brownies probably excites me just as much if not more than the perfectly cut ones so bravo I say. In fact when shooting cake as it is I often find I get more hits and comments because it all looks obtainabable and not too perfectly cut oh an dI feel good about it too as it usually means i have enjoyed the shoot and got to eat it sooner. The main thing that I can not get on my blog is pizza as I can not wait to eat it so I usally say sod it! Vintage Kitchen Notes – a peanut version sounds delicious too, will have to try. Choclette – aww, thank you! Cake Boule – I know! I make homemade pizza all the time but never want to wait to take photos before diving in! These are amazing! I see so many chocolate brownie recipes or white chocolate and raspberry blondies but never have I heard of dark chocolate and pistachio blondies!!! they’re two of my favourite things 🙂 YUM! LOL I don’t think i’ve successfully made brownies before but if I ever succeed I’ll definitely cut them when they’re still warm and gooey hehe YAY! Hehe I’m just like you, I can’t resist slicing a loaf of bread before it’s cooled and cutting into a tray of brownies before they’ve cooled too. Patience is a virtue except when you are tempted by delicious food. 😀 Your blondies look fabulous, and I think blondies and brownies are always best eaten warm. Brownies and blondies should absolutely be eaten still warm from the oven, that’s the best way to have them! 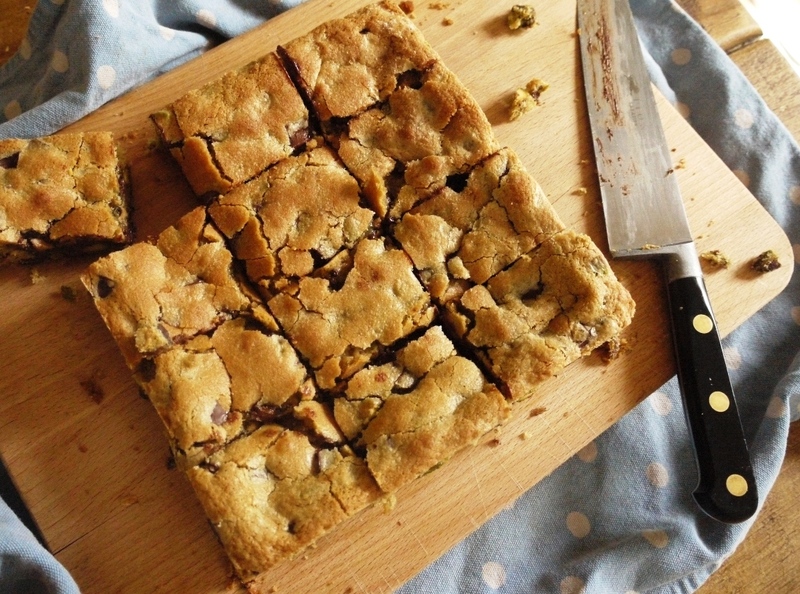 Blondies make me think of my mum; she was always baking off a batch of those and we could never let them cool either! This sounds like a winning combination! I have yet to try baking with pistachios. Even writing “baking with pistachios” is making me excited. My to-do list is just getting longer and longer! Why, why let blondies cool? I’m too impatient… er, passionate… about baked treats to not dive right in, straight from the oven. Yum! This combination is singing to me, by the way. Fantastic. That’s the beauty of brownies. A little craggy, a little gooey, a little homey, but ALL good. 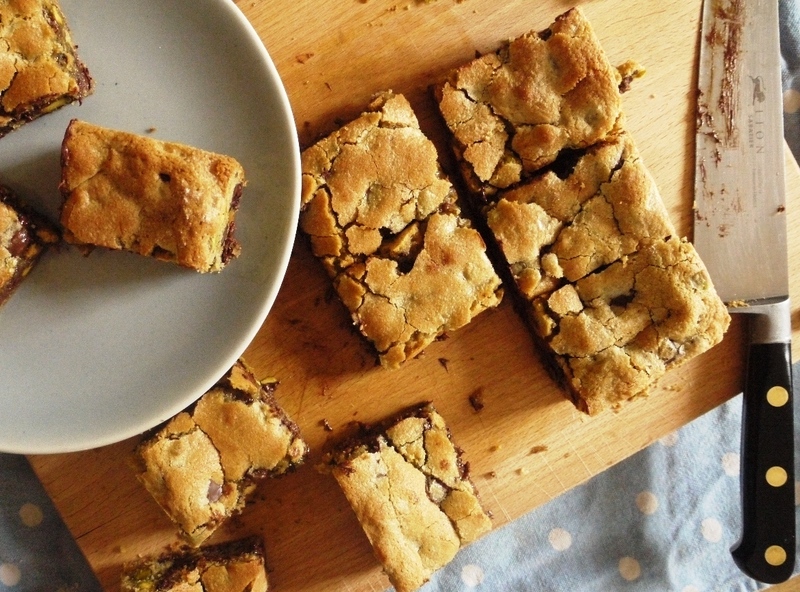 I haven’t had blondies in ages, and I love the pistachios and dark chocolate in these. 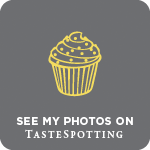 Baking Addict – aw, thank you! Daisy – I think brownies are one of the easiest things to bake as it doesn’t matter too much if you slightly undercook them. Do give them a go! Jennifer – definitely, preferably will a big scoop of cold ice cream! Kale – sounds like your mum is on my wavelength! A Taste of Madness – make sure you toast them first, brings out all the lovely nutty flavour. Terra – ah, thank you! Eats & Beats – so glad you enjoyed them! Jo – thanks so much for your lovely comment 🙂 I love pistachios too – really want to make pistachio ice cream soon! An Italian friend gave me her chef father’s recipe for pistachio ice cream (and a hazelnut one – aka nutella ice cream!). Unbelievably good – got my ice cream maker attachment freezing as we speak! Love love love your blog! I’ve never veered into blondie territory but you have inspired me to bake a batch asap! 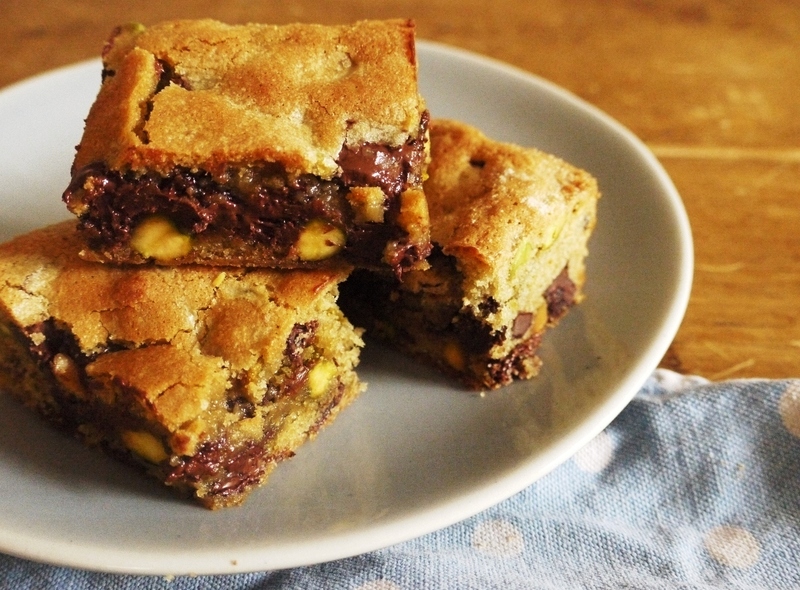 Pingback: Dark Chocolate Roasted Pistachio Blondies | Sweet Scot!